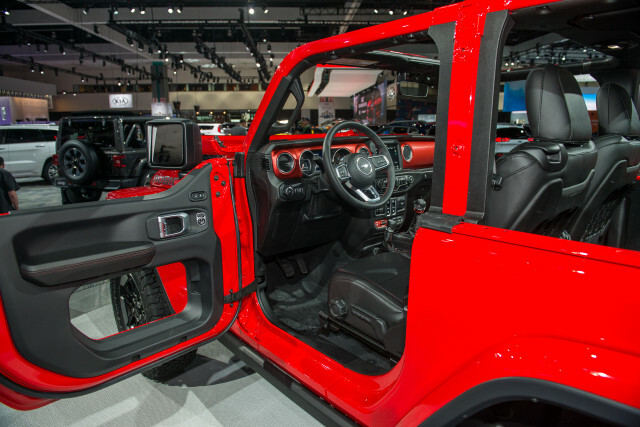 At the 2017 Los Angeles Auto Show, the Jeep manufacturer has confirmed the arrival of the newest 2020 Jeep Wrangler. This well-known off-roader will bring one major upgrade and it is the all-new plug-in hybrid engine. 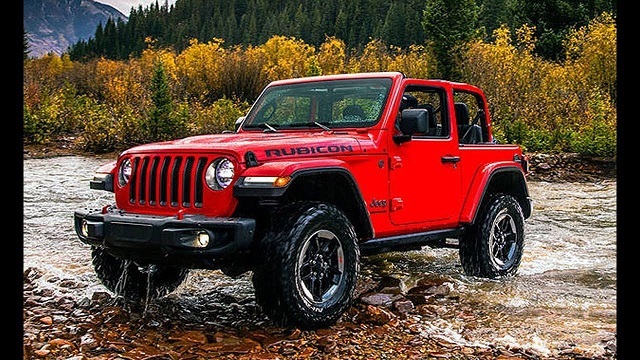 The 2020 Jeep Wrangler will bring some major changes in the engine department. However, it will use the same engines found in the 2018 and 2019 versions. So, the base unit will be a 2.0-liter inline-4 turbocharged unit which has the output of 268 hp and the torque of 295 pound-feet. This engine will work with an 8-speed automatic transmission. The next option is a 3.6-liter V-6 engine. This one is able to generate 285 horsepower and 260 lb-ft of torque. It will work with either 8-speed automatic or a 6-speed manual gearbox. With the manual transmission, this engine gets 17 mpg in the city and 25 mpg on the highway. Furthermore, the 2019 model year has introduced the new 3.0-liter V-6 diesel engine for the first time. This powertrain will be able to deliver 260 horses and 442 lb-ft of torque. On the other hand, the 2020 Jeep Wrangler should finally get a hybrid powertrain. Precisely, it will be a plug-in hybrid unit which should combine a 3.6-liter V-6 and, an electric motor, and a 16 kWh lithium-ion battery which is also used in the Chrysler Pacifica. In the terms of exterior styling, the 2020 Jeep Wrangler will probably return with the same design since the 2018 model year has been fully refreshed. It is now wider for 2 inches, longer, and features 2 inches longer wheelbase. It is more stable also and provides better space and comfort inside the cabin. As well, it will keep its familiar tough appearance and well-known seven-slot grille. There are also large, more pronounced headlamps. Furthermore, it will be available in traditional two-door, short wheelbase, and extended Unlimited four-door variants. Since it is an SUV with excellent off-road capabilities, the comfort isn’t its strongest point. However, since it is now a bit larger, space and comfort are significantly improved compared to the earlier versions. All the models feature sufficiently cozy seats which are covered in fabric or leather depending on a trim level. The access to the rear seats in the two-door models is not that easy but there is slightly more space than earlier. The dashboard is fitted with a standard 5.0-inch screen with infotainment. However, the larger 8.4-inch screen will be also available. The standard equipment in all models will include manual door locks, an audio system with 8 speakers, steering wheel-mounted audio controls, and roll-up windows. Some of the options will be air conditioning, navigation, a hardtop, a trailer-towing package, and a slip differential. The S model will add air conditioning, power windows and locks, alloy wheels, and tinted windows. However, the optional package will add remote start, heated seats and steering wheels, automatic climate control, and a 7.0-inch display, Android Auto, and Apple CarPlay connectivity. The Sahara will include leather, LED headlamps, body-color hardtop, dual-zone climate control, USB ports, automatic headlights, a garage door opener etc. 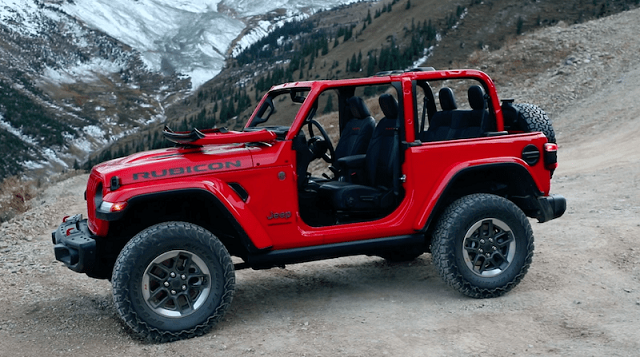 The carmaker still hasn’t confirmed when the 2020 Jeep Wrangler will enter the dealerships, perhaps sometime during next year. The price is also not yet revealed.